Product #45822 | SKU B-62CUS-GB | 0.0 (no ratings yet) Thanks for your rating! Have you ever wished that your lens could focus closer than it does? Imagine that you could put a magnifying glass in front of your camera's lens. Close-up lenses work in this fashion and are the simplest and least expensive method of close-up photography. They are available in different "powers" (dioptres). A +1 close-up lens will allow you to focus your lens somewhat closer than it already does. A +2 close-up lens will allow you to focus closer than the +1. A +4 lens will allow you to focus even closer than a +2, and so on. 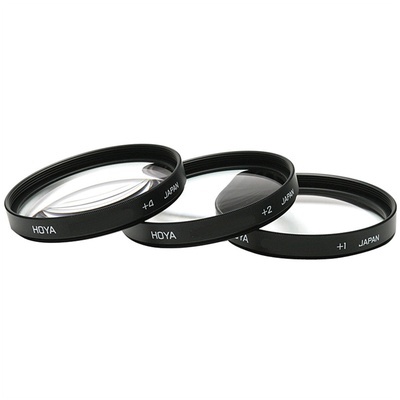 These lenses can be used individually or in any combination to achieve ultra-close focus. The maximum magnification achieved with these attachments will depend on the focal length of your lens as well as the actual close focusing capability of that particular lens.